In September 1859, a notice appeared in the Portland Guardian that ‘T. Hannay’ would be in the district for a few days “for the purpose of taking views of HOUSES and STORES, etc.”. Those who wanted their properties recorded in the new medium of photography were invited to place their orders. 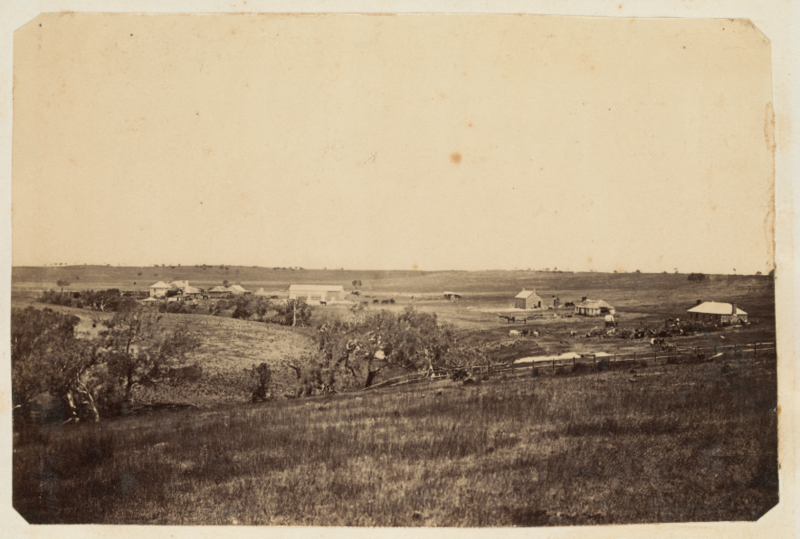 5 September 1859 p 3. 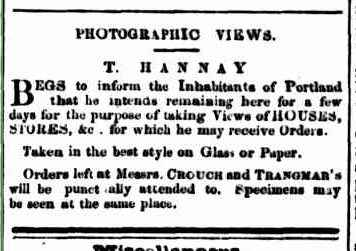 This advertisement is one of the few surviving documentary records of Thomas Hannay (1835-1897), an immigrant from Scotland who tried his hand as an itinerant photographer in the new colony of Victoria. 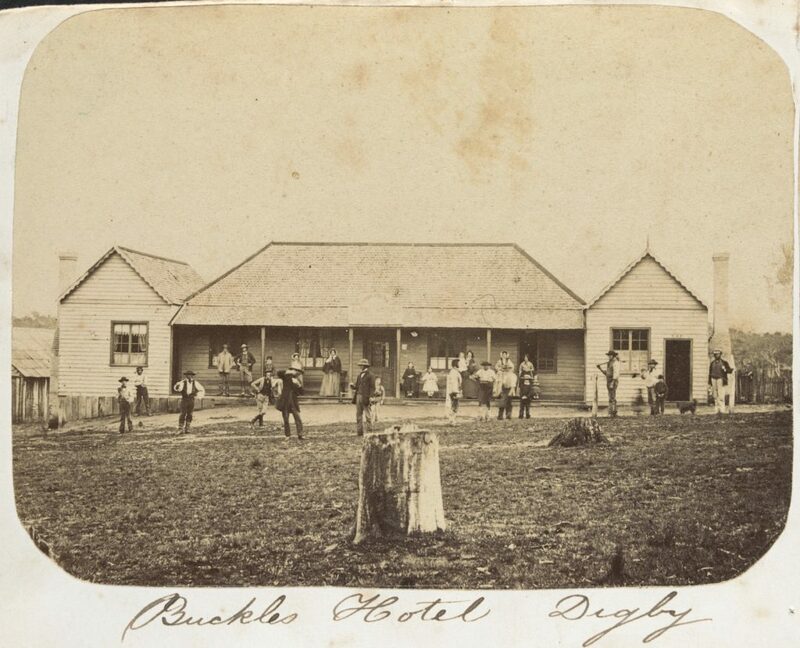 But his most important survival is a collection of over 90 photographs which he made while travelling around the Western District in the late 1850s. As well as visual records of raw new townships and individual homesteads, Hannay left an invaluable image of himself and his travelling darkroom. Under magnification, his name can be seen painted on the shafts of the cart. (The ‘T. Walsh’ on the canvas awning is the mark of a Melbourne sailmaker.) Hannay was using the cumbersome method of wet collodion glass negatives, which had to be prepared directly before exposure and processed immediately after. 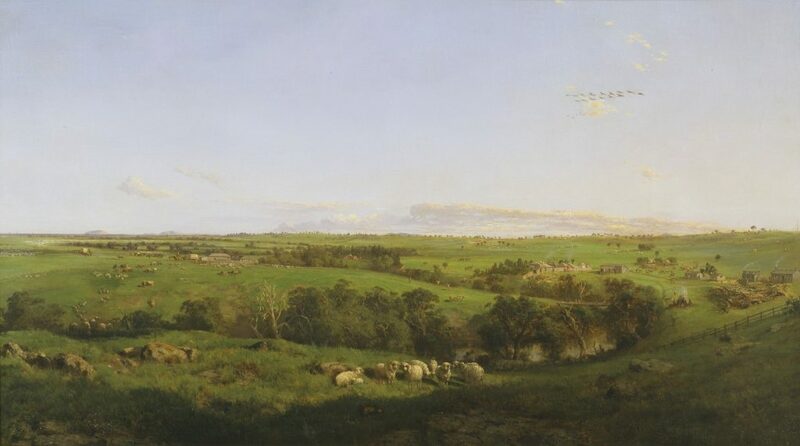 His view of John Cummings’ property Terrinallum shows it from almost the identical viewpoint taken by the artist Louis Buvelot in 1869, allowing us to compare it with Buvelot’s painting held by the State Library. 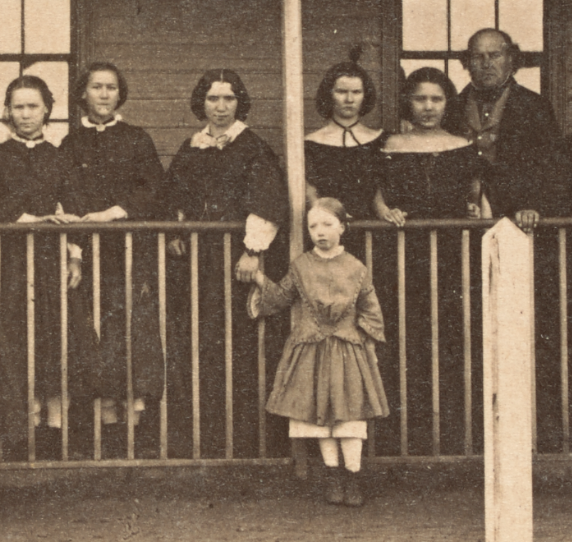 Hannay’s photograph of the staff and students of Miss Clarke’s Seminary at Portland reminds us that there was a time before smiling for the camera became customary, but it also discloses tenderness in the midst of solemnity. Thomas Dowling’s family pose on the front porch of their homestead at Jellalabad, near Darlington, the group including a splendid rocking horse. Unfortunately Hannay’s career as a photographer seems to have been shortlived. He originally emigrated from Scotland with his father in 1853. They are recorded at first in Geelong and Melbourne but by 1861 they had settled in Maldon where Thomas married a local woman Elizabeth Smith. He ran a stationery and newsagency and was active in the local community but no other photography by him is known. In 1892 he took up a post of Superintendent of the Immigrants’ Aid Society, and the family lived in Brunswick until his death in 1897. His photographs, purchased by the State Library from a private collection in 2013, are now viewable via the Library’s Image Pool, with the exception of a small number of culturally sensitive images of indigenous people. 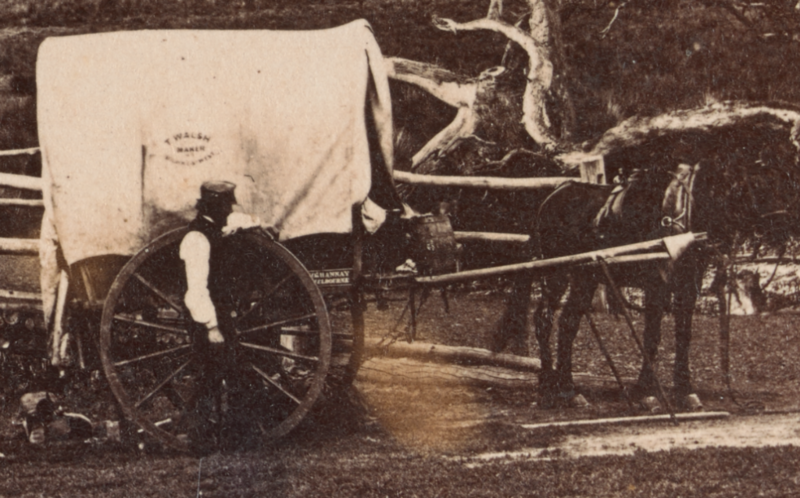 Original research for this post by State Library Victoria Pictures Librarian Madeleine Say. Explore the Pictures research guide for information on how to find photographs, illustrations and other images in our collection.